Upon entry and down a short hall to your left, you will find a full kitchen separated from the dining area and living room by a bar. Through the sliding glass doors on the opposite end of the living room is the balcony as well as an utterly breathtaking view of the Atlantic and a glimmering coastline extending as far as the eye can see. Back inside and down the entry hallway, there is of course the master bedroom, a guest bedroom, and a third special bedroom with bunk beds and a colorful underwater mural decorating the walls. Parents of children who have stayed in this special room have shared that the kids really enjoyed the room and did not want to leave. In each bedroom, there is a flat-screen television. There is also a flat-screen TV in the living room for those who are able to peel themselves away from the stunning spectacle outside. Ripleys Aquarium, Wonder World, Medieval Times, Hollywood Wax Museum, Myrtle Waves Water Park, and MANY other attractions are 22 miles south also, in the same area. This is a very easy drive straight down HWY 17. Sam's is also there. Pirates Voyage (a Dolly Parton dinner theatre) is about 10 miles South on 17 from the condo. Not far north on Ocean Boulevard is the Cherry Grove Pier. So much is within your reach. If you have any questions or special requests, please feel free to contact us at your convenience. Thank you for viewing our property. We hope to see you soon! After searching many states and properties.......I knew when I saw this one.....it was the one for us in the South Carolina area. The moment you open the door, if the balcony door is open, you feel the breeze from the ocean. Step out on the balcony and see nothing but ocean and you will never want to leave. Clean, well managed, well maintained and monitored. The unit and the building have both been updated recently. Ocean side pool and hot tub. 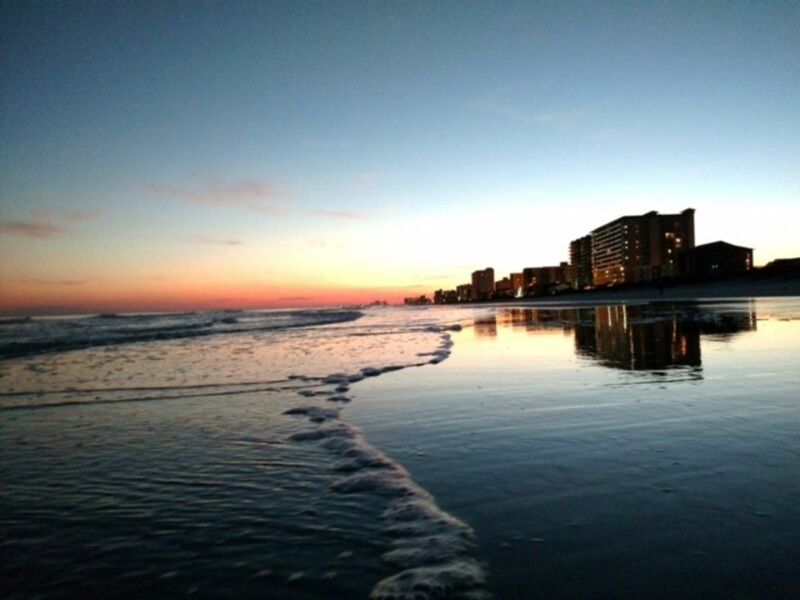 Step out of the condo and you are on the beach... For information on all properties in our network or to reach us directly, please find us on the web at Sincerely Sharry Properties. We can offer this view at our Tennessee properties. LEADS FROM THE PARKING GARAGE TO JUST OUTSIDE THE CONDO DOOR. OPENS AT EASTER AND CLOSES IN MID-OCTOBER & GOES TO A WEEKEND, BY REQUEST ONLY OPERATION. WE CAN NOT BE RESPONSIBLE FOR CLOSINGS DUE TO REPAIRS. The unit was very clean and roomy. It was decorated and furnished in a way that was very welcoming and comfortable. The view from the ninth floor balcony was spectacular. We would definitely stay there again! We had to book this property at the last minute when our original plans fell through. From the moment we expressed interest in this unit until the moment we departed, Sharry did everything in her power to ensure that our stay here was enjoyable. And it was terrific! Beautiful condo right on the beach with unbeatable ocean views. We hope to stay here annually. Could not ask for more. Awesome condo with an amazing view! My family (my husband and two teenaged daughters) stayed in this condo the week of 4th of July. The condo was clean, beautifully decorated and very spacious. It has everything you need and all the comforts of home. The layout is great since we never felt we were all on top of each other. The view is just amazing. We spent every morning and night out on the balcony! We couldn't get enough of the view. The beach is easily accessible and not as crowded as other areas are on the strand. We just loved it here. We had a few questions during our stay and Sharry is so sweet and very responsive. We hated to leave and would definitely stay here again or at another one of Sharry's properties. We all had a great vacation. Thanks for everything! Thank you so much for this kind and informative review. We are all delighted that you enjoyed the condo, the view, and our service. We are also excited that you will be returning to this or another Sincerely Sharry Property:) We will look forward to your return. Awesome experience with sincerely Sharry. Beautiful view and easy access to the beach. Bedrooms are set away from living space which made it ideal for our two grandchildren to sleep while we watched a movie. The layout of the condo was great. We thoroughly enjoyed our stay and will definitely be coming back here again soon. Thank you so much for your kind review. We enjoyed working with you and will look forward to your return to this or another Sincerely Sharry Property. By far the most clean, kept up place we've stayed in with an amazing view! Thank you so much for this wonderful review. Please allow me say how much I appreciated having you as a guest. It makes such a difference when the guest reads and follows the information we provide. The other thing I want to thank you for is taking such good care of the condo. Our housekeeper works extremely hard to keep up with our high standards and we so appreciate guests who don't make her job any harder than it has to be:) We look forward to your return to this property or another Sincerely Sharry Property. Thank you so much for your kind review. You were such pleasant guests to work with and we will look forward to your return.